Northern Irish trainer Andrew Oliver enjoyed a first win on the Rowley Mile with his first ever runner as Sendmylovetorose won the Irish Thoroughbred Marketing Cherry Hinton Stakes. The filly was withdrawn at the start of the Albany Stakes at Royal Ascot after getting trapped under the stalls, but was back to winning ways at the Curragh 12 days ago, and built on that to oblige by a neck as the 2/1 favourite under Colm O’Donoghue. Oliver said: “I told Colm to keep it simple during the race and he has done that and given her a lovely ride. “I bought her cheaply but she does have a pedigree and she is tough. “She handles soft ground. I am not saying she needs it but it does play to her advantage and we won’t know how she goes on quicker until she tries it. O’Donoghue added: “She is still relatively inexperienced and I didn’t get to teach her a lot in her first two runs. Obviously, she has the ability and handles the ground well. It’s great to come here and win these big prizes and I am delighted for her connections. “She is a lovely filly and she is going from strength to strength. Andy gave me great confidence - he said that I knew how to ride her and that I should just do my own thing. Maureen, who was a neck second in the Irish Thoroughbred Marketing Cherry Hinton for Richard Hannon, had won her maiden at Newbury three weeks in some style, and according to Richard Hannon Jnr, assistant to his father at East Everleigh, was the class act in the field today. “I thought she was very unlucky,” said Hannon Jnr, “I think she should have won but she just didn’t get the gaps - she was the best filly in the race. The ground was fine for her but she just couldn’t get out when she wanted too. 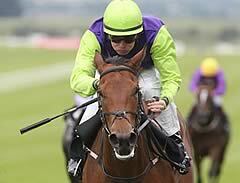 Jadanna, who was third for trainer James Given, could go for the Molecomb Stakes at Goodwood next. “She just didn’t quite get home” said her trainer. “On the day on this ground we just found two too good, we will probably go back to five furlongs now.